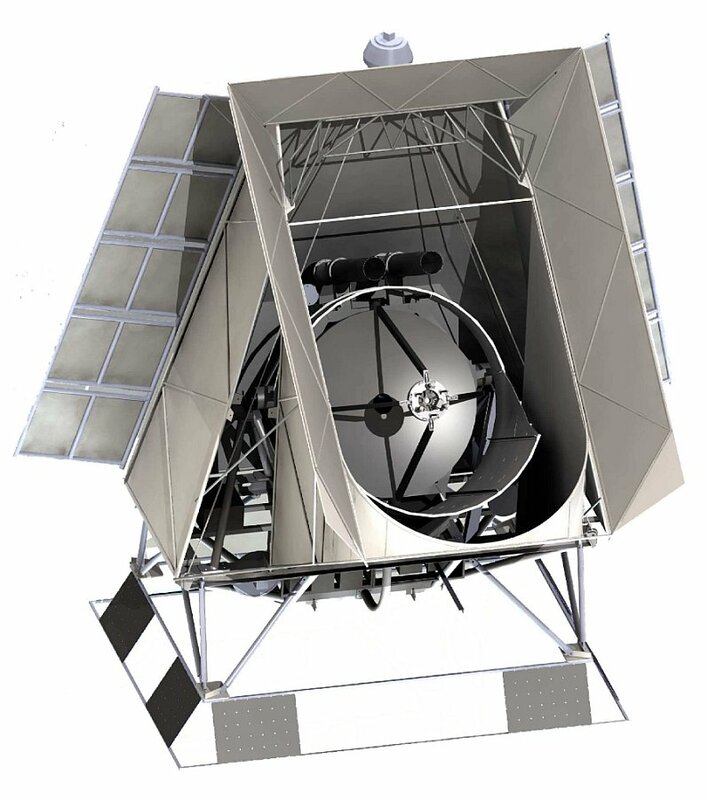 Is a stratospheric telescope conceived to measure photometric redshifts, rest-frame FIR luminosities and star formation rates of high-redshift starburst galaxies, thereby constraining the evolutionary history of those galaxies that produce the FIR/submillimeter background, also to measure cold pre-stellar sources associated with the earliest stages of star and planet formation and to make high-resolution maps of diffuse galactic emission over a wide range of galactic latitudes. A final goal is to observe solar system objects including planets, large asteroids, and trans-Neptunian objects. The instrument is composed of a Ritchey-Chretien telescope, with a 1.8 m diameter, aluminum primary mirror with a mass of 114kg. Originally, the mirror was intended to be used only for the first BLAST test flight done in 2003. However, after the destruction of the carbon fiber mirror on landing of the last BLAST flight from Sweden to Canada in 2005, the aluminum mirror was re-machined to improve the quality of the surface. A 40cm diameter aluminum secondary was suspended by four carbon fiber struts (with a zerolinear thermal expansion coefficient) attached to the perimeter of the primary mirror. The focusing system also was modified with the aim to correct the thermal motion that affected the relative distance between the primary and the secondary mirrors by adding a motorized system for inflight refocusing of the secondary. Three stepper motor actuators drive the mirror back and forth to correct for the focus position, as well as adding tip/tilt capability to initially align the secondary to primary. The cryostat houses most of the receiver system. It is constructed of aluminum and G10 woven fiberglass reinforced resin epoxy and is maintained at vacuum to prevent thermal convection. Each thermal stage is light-tight except the optical path, which is thermally protected with infrared blocking filters. Liquid baths of nitrogen and helium maintain the temperatures of the 77K and 4.2 K stages. In flight, an absolute pressure regulator is used to maintain approximately 1 atm above each bath. A vapor cooled shield is located between the nitrogen and helium stages which is cooled by boil-off gas from the helium bath and reduces the thermal loading on the helium stage. The cryostat holds 43 liters of nitrogen and 32 liters of helium and has an 11.5 day hold time. The BLAST focal plane consists of arrays of 149, 88, and 43 detectors at 250, 350, and 500µm, respectively. The arrays are cooled to a temperature of 270mK. Each array element is a silicon nitride micromesh "spider web" bolometer. 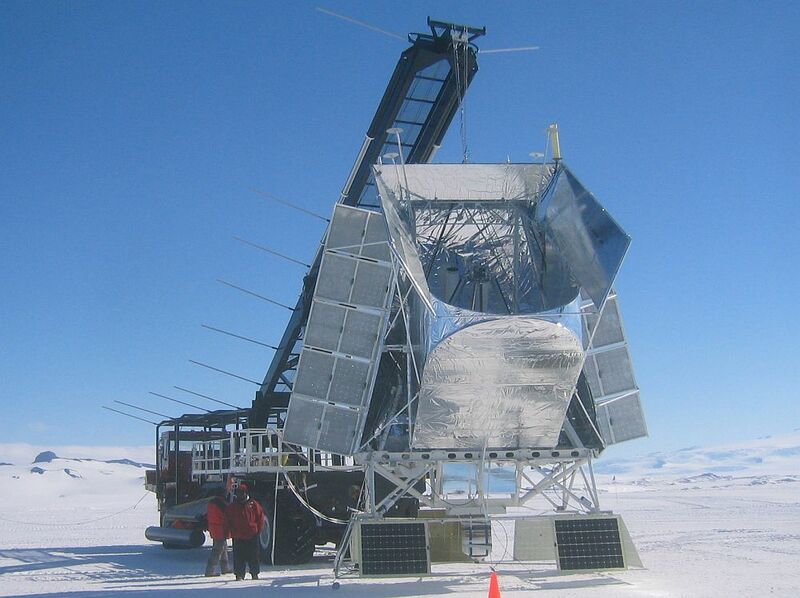 The detector arrays, the feeds, and the mounting scheme are based on the SPIRE instrument design. The detectors are read out with an AC-biased differential circuit and then the data acquisition electronics demodulate the signals to provide noise stability to low frequencies, allowing to observe the sky in a slowly-scanned mode which is the best method to observe large regions of sky. The data is collected using a high-speed, flexible, data acquisition system which can synchronously sample up to 600 channels. Each channel consists of a buffered input and an analog to digital converter. The output from 24 channels are then processed by a logic device which demodulates each input and are stored to disk. All these elements are mounted in a specially built gondola composed by three main components: an outer frame, suspended from the balloon flight train by cables and a pivot motor; an inner frame which is attached to the outer frame at two points along a horizontal axis; and a set of Sun shields that attach to the outerframe. The frame is constructed of light-weight aluminum tubing and I-beam. The outer frame is pointed in azimuth using two elements: a reaction wheel with a diameter of 1.5 m made of 7.6 cm thick aluminum honeycomb and a vertical axis pivot at the attachment of the gondola to the flight train, which also minimizes the external torque from wind shear acting on the gondola and balloon rotation. It also provides mounts for various electronics boxes, including the flight computers, the CSBF electronics, various pointing sensors, and flight batteries. The inner frame is made from thin-wall aluminum box beam. It supports the telescope, cryostat, detector read-out electronics, gyroscopes and star cameras. It is attached to the outer frame at two points, defining an axis of rotation controlled by a motor mounted on one side of the inner frame at the attachment point to the outer frame. A free bearing provides the connection point on the other side. BLAST is designed to operate autonomously without need of ground commanding. Telescope control is provided by a pair of redundant flight computers with Intel Celeron processors, running Linux as operative system. The computers are kept at near atmospheric pressure to allow the hard drives to function properly and to provide the appropriate thermal environment for the CPUs. The communication link between the telescope and the ground is provided by CSBF through a number of line-of-sight (LOS) transmitters and satellite links. The primary pointing sensors for BLAST are a pair of CCD-based star cameras and Fiber-Optic rate gyroscopes. The star cameras provide absolute pointing and the gyros provide velocity information which can be integrated to allow interpolation of the gondola's attitude between star camera solutions. Coarse attitude determination is provided by several additional sensors: in elevation, there is an encoder on the elevation axis and a tilt sensor on the inner frame; in azimuth, there is a Sun sensor, a differential GPS unit, and a flux gate magnetometer. Solar panels mounted at the back of the telescope on the support structure for the Sun shields, provide power to the flight electronics by charging NiMH batteries. The panels face the Sun from only one side and are radiatively cooled to the sky from the other side. 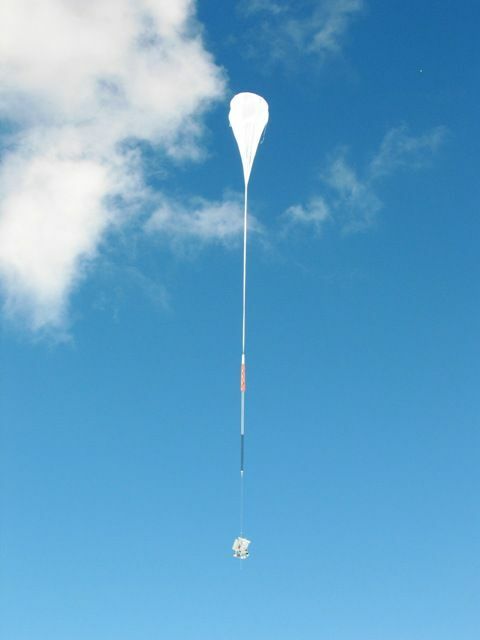 The balloon was launched on December 21th, a little after 2:00 UTC, by dynamic method with assistance of the launch vehicle. Although the launch was very clean, the team of scientists were a bit worried at the moment of the gondola launch: after the balloon was released and meanwhile it was almost vertical over the launch vehicle, the glove of one of the rigging guys entangled with a reins, delaying a bit the moment of the release of the gondola by the launch arm. Aside that, the launch went smooth and after a few hours the balloon reached without trouble the planned ceiling. On January 2th, 2007 and after traveling almost 3000 nautic miles during 12 days the BLAST's liquid helium supply was depleted so the entire system was turned off and secured for termination procedures. 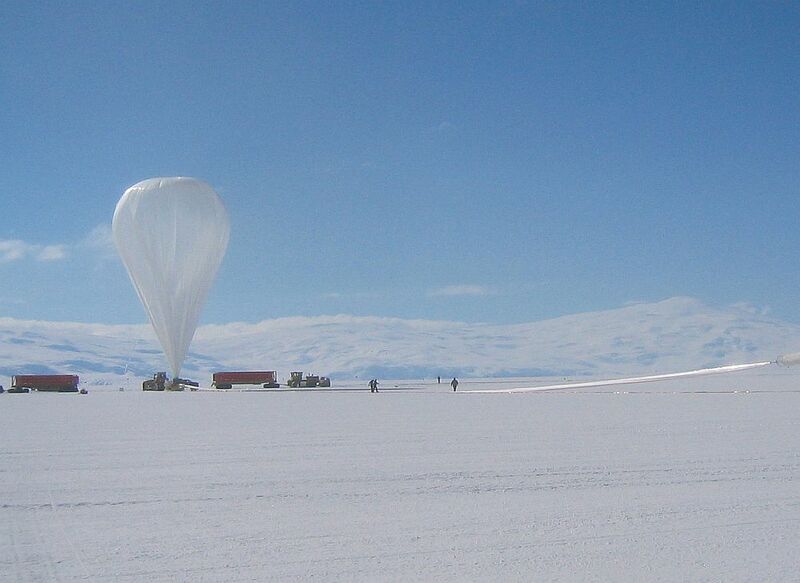 The payload was separated from the balloon in a point located west of the Trans-antarctic Mountains, 410 nm SW of the launch base McMurdo Station. Apparently the parachute opening was more violent than anticipated provoking the loss of the communication link beetween the falling package and the CSBF control center in Palestine, Texas. Although the quick reaction of the personnel trying to restore the link in several ways, was impossible to perform the separation of the parachute after impact. Thus, the orange/white canvas which allowed a safe return to earth turned in a huge sail, which fueled by the endless polar wind, dragged the craft over the ice making a furrow on the ground near 120 miles long. Along the path of the runnaway gondola BLAST was scattered to useless pieces in less than 24 hours before the gondola come to rest in an ice crevasse. A recovery team departed from Mcmurdo on January 3th and found that BLAST structure stop his ground travel within a large crevasse field so the Twin Otter was unable to land close enough for the recovery crew to reach the payload from the ground. The following day, the pressure vessel (containing the 2 hard disks of recorded data mirrored on both of them) was spotted from a plane dispatched from McMurdo. 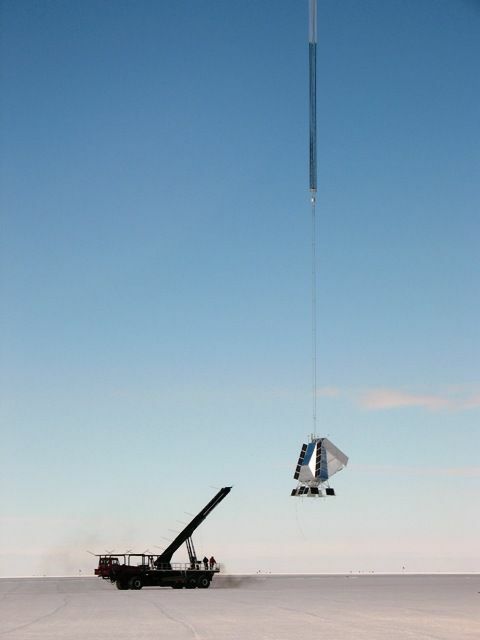 It was located in an area wich provided better landing conditions so in January 6th a recovery team was deployed there and the data vault was returned to McMurdo that same day to be sent back to the States by the scientific team. Another Twin Otter mission was dispatched on following days to recover additional BLAST components from a prioritized list provided by BLAST's Principal Investigator, Dr. Mark Devlin. This was the second scientific mission of the project. During the flight aside minor issues in the back-up gyroscopes and the GPS system BLAST performed flawlessly. There was conducted shallow and deep extragalactic surveys of the Chandra Deep Field South as well as a 10 square degrees region near the South Ecliptic Pole. A Galactic survey in Vela mapped 52 square degrees and 200 square degrees of sky in deep and shallow observations, respectively. Surveys of several Galactic and extragalactic selected targets were also conducted. and the scientists were very satisfied with the data obtained. The tragic end of the flight jeopardized the entire project. But after the recovery of the data vaults (see above in Details of the balloon and launch operations) the disks were sent to a specialized firm which restored the data to let the scientist to analyze it. More than two years after the data obtained lead to a series of groundbreaking discoveries about the first stages of growth of the Universe just after the Big Bang. The data was published in April's edition of Nature magazine, and combines the BLAST survey measurements at wavelengths below 1 millimeter with data at much shorter infrared wavelengths from the Spitzer Space Telescope. The results confirm that all the Far Infrared Background comes from individual distant galaxies, essentially solving a decade-old question of the radiation's origin. The exploitation of the rich data coming from the observations made during the 2006 flight will produce in the near future other papers on topics like dust-enshrouded galaxies, their evolutionary history, any relationship with other galaxies, and associations with larger-scale structures in the Universe. A panchromatic study of BLAST counterparts: total star-formation rate, morphology, AGN fraction and stellar mass Submitted to ApJ.